3D2N Nature Exploration Camp @ Royal Belum State Park, Malaysia. Explore the nature and learn the rain forest way. Our 3D2N Nature Exploration Camp introduce children to basic survival skills while exploring nature, some basic about flora and fauna of Royal Belum 130 million years rainforest. Exploring the jungle need some skills. Well at least we know the jungle ethics of what to do and don’t. Learn to conserve nature while protecting our massive biodiversity. Suka-Suka Island Retreat, Lenggong, Perak, Malaysia. We are planning for a weekend gateway to Suka-Suka Island Retreat, Lenggong, Perak on 17-18th December 2011. The place is so peaceful, you’ll enjoy the scenery, fishing or kayaking on the lake. We love to host our photography session here due its traditional settings. Come enjoy the nature. Drive yourself to the jetty, park at Cita-Cita Village and take a boat ride to the island. 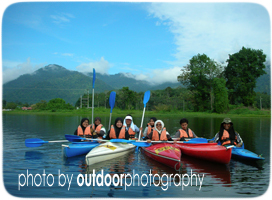 Can visit Museum of Archeology, Lata Kekabu and Relaxing / Kayaking / Fishing / Birding / Photography. RSVP – SMS +6010-342-4848 / email belum.outdoor@gmail.com. RM150/pax.